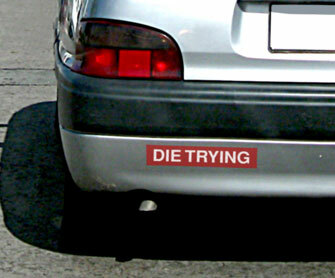 Driving back from Pleasanton, on Friday, September 1, 2000, I spotted a bumper sticker that may be my competition rallying cry for a while: "Die Trying." No, this is just a photo illustration I made up in Photoshop, but it gives you the idea! My fourth piping competition was held at the Caledonian Highland Games (a.k.a. the "Pleasanton Games") at the Alameda County Fairgrounds. It was a rainy, but not too cold day. Also competing in the Grade IV Piobaireachd category were Eric Seib and Nancy Fredrick, two local piper friends and members of Santa Cruz Pipes & Drums. Nancy went on to place third. There was no steward controlling the event, so we had to walk up and ask the judge who he was waiting for and if we could play if the scheduled piper didn't appear to be there. Not a big deal, but a little different. We helped each other tune up our pipes, since our PM/instructor Jay Salter is recovering from a fractured foot and couldn't make it. Nancy has a very good tuning ear. In the 2-3 minutes from the time I was tuned up to the time I struck in for my event, my drone tuning had shifted—or the possibility also exists that I changed my bag pressure. Maybe I was trying too much to be relaxed and so I wasn't pressing hard enough. In any case, disappointing. My chanter cut out twice (once barely in the beginning and once later). This was foreseen by Jay since I was playing a new reed barely two weeks old that requires a higher pressure to sound. At our "practice competition" two days before, he reminded me to keep the pressure up as the reed was a little prone to cutting out. My practice performance had no chokes. Part of bag pressure situation could be my approximate six week hiatus from the "big pipes" ended about three weeks earlier. I was getting over the worst part of tendinitis in both wrists. My wrists probably won't be completely healed until Spring—I hope not longer! I played my taorluaths deliberately slower and more open since Jay pointed out that I was slightly crashing them. Unfortunately, I played them a little too open compromising the speed. I should have gone for "open" but fast. The judge was right on the mark there. I felt really good about the expression of the tune, and I had felt more sure going into and during the competition even with the chanter chokes. I didn't miss any notes and held the notes I felt I should have. I was very surprised to see the "more feeling" comment on the judging sheet. Eric and I practiced "Too Long In This Condition" at least twice a week together and therefore played the tune very similarly with regard to phrasing and expression. Yet, Eric who competed immediately before me (the scheduled intervening piper wasn't there) with the same tune was given a "good expression" and I received a "more feeling." Perhaps we should have recorded the performances to understand what the judge heard. Listening to the other pipers competing, I was impressed with a number. Some were mechanically very good but lacking in expression. There was one young piper named Sarah who I thought had outstanding expression. But who am I to judge expression, I guess. Sigh. I just hope I can get off from work to compete at the Loch Lomond Games in a month. But staffing is pretty slim now at work, time will tell. Drones quite rough over chanter.